It seems to be raining babies in my familial and social circles these days. Most of my friends and family seem to be knocked up or have just had a new squirming baby enter the scene. Seriously, I think that 2012 is the year of the bouncing baby. 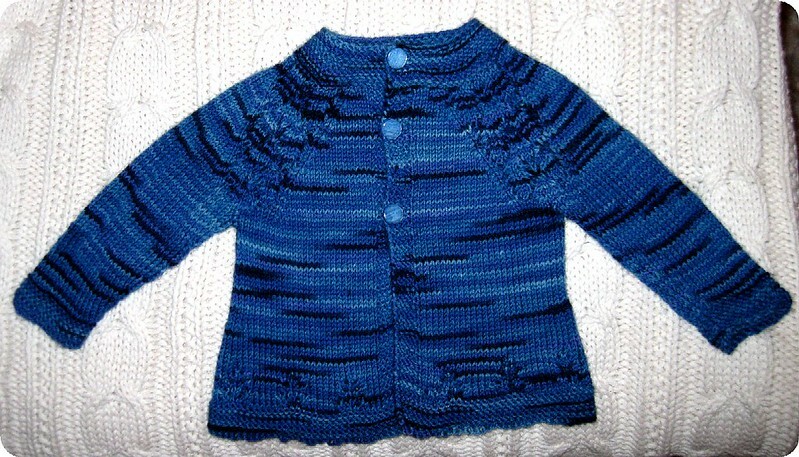 And so was my line of thinking when knitting this really sweet baby cardigan for my dear friend Monica’s first child, Emily. This wee bundle of joy was born on March 29 and I started knitting on April 2. I figured that it would take me perhaps 2 weeks tops to finish the cardigan. Boy was I wrong. Two Horrible Things Happened. Horrible Thing #1 – I injured a rib and the muscles surrounding my left rotator cuff. This meant that basically any task where I had to lift my left arm up even 45 degrees meant extreme pain and muscle spasms. I was losing sleep because of the pain. Its been about 4 weeks and its still problematic. Cue having to put down any knitting (to say nothing of my weekly dance class and my workouts) for a while. Horrible Thing #2 – I had been warned that this particular pattern, Maile, was very fidgety when joining the sleeves to the body of the cardigan. I read a bunch of helpful notes on Ravelry and most knitters were saying to use a stupidly long circular needle (i.e. 60cm) and magic-loop the join. They were right, I was speeding along with the body and the sleeves and when I went to join them, OUCH. Not fun, and took way longer than I would have expected. I didn’t manage to send out the finished cardigan until May 14. But I did send it express, and Monica should get it today. I figure Emily should get about a month’s usage out of the cardigan (crosses fingers). The other weirdness was that my buttonhole count seemed to be off even though I was knitting the pattern exactly as written. I had to fudge the finishing of the collar to accommodate another buttonhole so that I had 5 as per the pattern. In the end, I only ended up sewing on 3 of the buttons as I thought the cardigan was looking a bit busy; and also because I was advised that trying to close 5 buttons on a squirming baby would also be hellish. I mailed the extra buttons in case they happen to pop off in future. Overall, I’m happy with how this cardigan turned out. Would I knit this pattern again? Probably not. However, it is rather cute and I’m happy to have made something that will probably been an heirloom in my friend’s family for years to come. Points for the pre-process Stashdown! You are currently reading A cardigan for Emily at When Gaia Smiles.